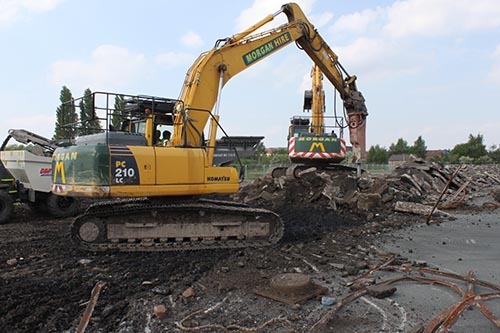 Morgan has started work on the first phase access road into the massive new Northern Gateway extension to Deeside Industrial Park, for the Welsh Government. The £3.1m contract is for the construction of a 0.8km single carriageway highway including junctions and roundabouts, foot-ways and cycle ways. The new road into the site is off the Welsh Road, north of the River Dee, west of the A550 and A494 near Garden City. The first phase of the road will take less than a year to build and there are further phases of the project to extend the road to open up further development sites. The road is seen by the Welsh Government as a major strategic project opening up 420 acres of development land. Deeside has been designated as part of the Deeside Enterprise Zone. HM Treasury have also announced that enhanced capital allowances are to be made available to support selected investment on part of the Northern Gateway Site. Outline planning permission is in place for Northern Gateway, owned by Praxis and Pochin Goodman. Praxis site. Pochin Goodman plans a technology park in a campus layout retaining listed buildings and including a new hotel and training centre. Flintshire County Council have passed a resolution to grant outline planning consent to Praxis for the northern part of the site for approximately 3m.ft² of commercial floor space together with consent for residential development providing in excess of 700 new homes. The Council have also passed a resolution to grant outline planning consent to provide a further 1.2 m.ft² of commercial buildings, 500 new homes and a hotel.